JoReels Casino is a new online gambling operator that was established in 2017, with high expectations. Licensed in both Malta and the UK, it accepts players from a dozen countries, including the United Kingdom, Scandinavian nations, Canada and many more. As a new casino is has the advantage of using the latest technologies and players are invited to browse a user-friendly, easy to navigate website. JoReels online casino also tells a story, with lots of tongue-in-cheek humor and colorful cartoons that catch the eye. This is a very serious gambling operator that doesn’t take itself too seriously and invites players to have fun in a laid-back environment. New players and existing customers are presented with generous bonuses, access to exclusive promotions and reliable payment methods to cash out winnings. Those who think that an online casino is only as good as the games it offers, are likely to have a lot of fun with JoReels Casino. That’s because the IGC Casino platform is stable, ideal for mobile users and supports all the popular live dealer games. Smartphone and tablet users powered by iOS and android operating systems can use their gadgets to play any of the JoReels casino games. These games are audited for fairness and carry a low house edge, so players can have a lot of fun and risk very little. There are more than 650 games to choose from and these include a very healthy selection of table games. American and European roulette as well as other varieties of the popular game can be played against real dealers. Those who are in the market for Baccarat, Red Dog, Caribbean stud poker, Three Card Poker, Casino Hold'em and Ultimate Texas Hold'em will find them here as well. Their games can be played at high-stakes, reasonable limits and even for free so all expectations are met. Highrollers and savvy players can try their luck at VIP blackjack and roulette games, at stakes as high as £2,500. Players who would rather spin the reels of JoReels slots and let luck decide the outcome of games won’t be disappointed either. That’s because more than half of the games available belong to this genre and they include both classic and original titles. Emoji Coins, Fruit Blast, Wild Run, Wins of Fortune, Wild Dodo and Temple of Luxor are just some of the many slots available. Last but definitely not least, the JoReels jackpot available on selected slots is the gateway to untold riches that so many players secretly dream of. Nothing says “Welcome!” better than a welcome package and that’s why the JoReels casino bonus is so important to new customers. As a new member, one can hope to have the first deposit matched by 100% up to a maximum of £100 or currency equivalent. Once they sign up, players can make a second deposit and get an additional £100, this time representing 50% of what they invest. On top of the cash prize, players can also expect to receive the JoReels free spins which are awarded to them over the course of five days. They will receive 10 on a daily basis, giving them plenty of time to check out all the popular slots available. With wagering requirements of 40 times for free spins profits and 35% on the combined amount of deposit and bonus, the JoReels bonus is easy to clear. This is just the tip of the iceberg and players can unlock more cash on a weekly basis, including €20 from Monday to Friday between 8 PM and 10 PM UTC. 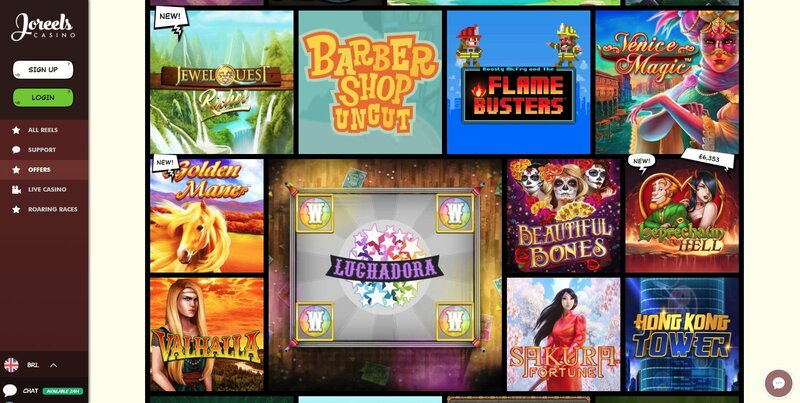 They will also receive 10 free spins that can be used on popular JoReels casino slots such as Jungle Spirit, Butterfly Staxx, Koi Princess, Gonzo’s Quest and Spinata Grande. Players can also participate in the weekly Roaring Races to win a share of the free spins worth a total of €1,000. Good things come to those who gamble over the weekend as well, with £20 up for grabs when players deposit on Saturday and Sunday. Each weekend the name of the eligible slots change, but this is actually good news, since players get to experience the thrills of different games. This means that even though the JoReels casino welcome bonus is so important there are plenty of other incentives to be claimed. JoReels casino payment methods make it easy for players to deposit and withdraw winnings quickly and with minimal costs. The list of accepted banking options include Visa, Mastercard, Trustly, Skrill, Neteller, PaySafeCard, Zimpler, Bank Transfer, Entercash FI, Ecopayz, iDEAL, InstaDebit, P24 and SOFORT. Deposits in USD, Euro, GBP, SEK, NOK and CAD are supported and players can load their account with as little as €10. Assistance is provided to those in need over the phone, email and fax and their specialists are fluent in six languages. Once again Scandinavian players can consider themselves lucky to be able to interact with experts that speak their languages in addition to English. There are plenty of online casinos out there, new and old that promise to offer something truly different to prospective customers. JoReels Casino has a lot to prove since it was only founded in 2017 but it is built on a strong foundation. It has an impressive and well diversified collection of mobile-friendly games to keep players interested for a long time. Fast withdrawals, a plethora of promotions and generous bonuses also help their cause and are likely to keep even the most demanding players happy. - Over 750 mobile friendly games available in instant play format. - 24/7 customer support available in several languages and reliable payment methods. - Live dealer games that can be played at low and high stakes. - No video pokers and scratch cards for the fans of the genre.